Ferdinand Georg Waldmüller is one of the great figures of 19th-century Austrian painting. In addition to landscape he also executed portraits and genre works, the latter becoming an important area within his oeuvre from the 1840s onwards. Waldmüller studied with various artists over a period of ten years, while also attending classes at the Academy in Vienna. His earliest works were commissioned copies of the masterpieces to be seen in Viennese galleries. In 1822 he participated in the Academy exhibition for the first time, showing a number of paintings, and was be appointed a professor at that institution in 1829, although the relationship was never particularly cordial due to a series of polemical texts by the artist in which he severely criticised the Academy’s teaching system. The Emperor himself mediated in the conflict, taking Waldmüller’s side and helping his career by commissioning a bust-length portrait of himself in 1827. The two canvases in the Collection, which are not a pair, are dated 1833 and 1836 and are both signed. They date from Waldmüller’s most active period during the decade of the 1830s, a phase characterised by the quantity and quality of his paintings, which included landscapes and portraits. The style of his canvases indicates the general move away from the Romantic depiction of the landscape as grandiose and inaccessible, reflecting the new importance of the growing middle-classes, whose tastes determined current styles. As a result landscapes of this period tended to depict peaceful, tranquil and pleasing views of the outskirts of villages and cities or mountains. These two canvases entered the Collection at different dates. In the first Waldmüller depicts a village near Salzburg, framed by mountains painted in cool tones with an emphasis on blues and violets, as we also see in the second canvas. The solid bulks of the mountains form a contrast with the village and the river running through it, as well as with the extensive lines of trees that conceal a modest hut on the slopes of the Schönberg. 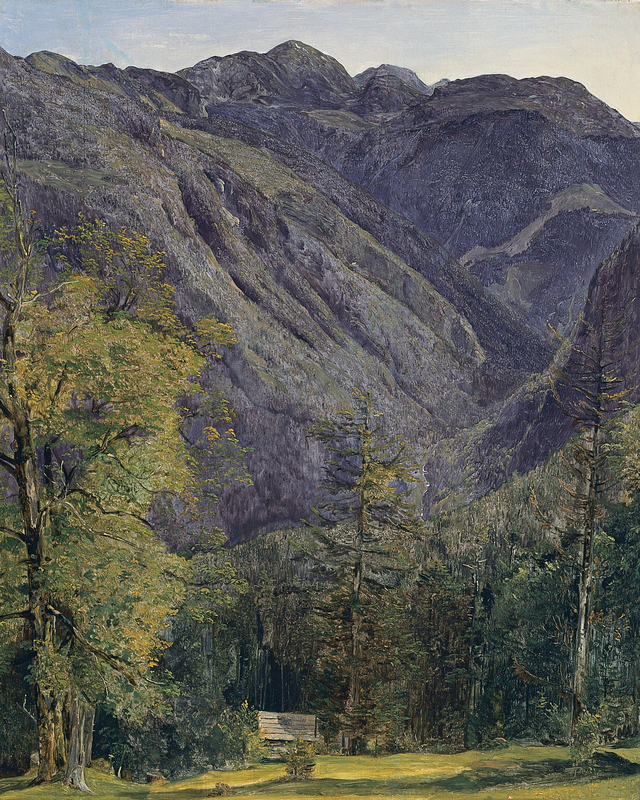 The two canvases reveal Waldmüller’s extremely precise technique that was able to adapt itself to the new style and to reproduce both the smallest background details and the principal foreground elements without loosing definition. This is evident in the way he has constructed the pronounced slopes of the Schönberg and the dense and compact branches of the trees whose individual leaves can easily be distinguished on the right. This use of minute detail would be characteristic of the artist’s works and was taken by Waldmüller to its maximum expression in his portraits and peasant scenes.